Spinach and mushrooms, along with cheese, make a tasty filling for this meal. Cook pasta as directed on package, omitting salt. Meanwhile, heat large nonstick skillet on medium heat. Add mushrooms and garlic; cook 5 min., stirring frequently. Remove from heat. Beat egg whites in medium bowl. Add mushroom mixture, spinach, ricotta and half each of the mozzarella and Parmesan; mix well. Drain pasta; fill with spinach mixture. Place in 13x9-inch baking dish sprayed with cooking spray; cover with sauce. Bake 40 min. or until heated through. Top with remaining mozzarella and Parmesan; bake 5 min. or until mozzarella is melted. We've recreated this Italian classic using better-for-you ingredients to save you 160 calories and 12g of fat, including 6g of sat fat, per serving. 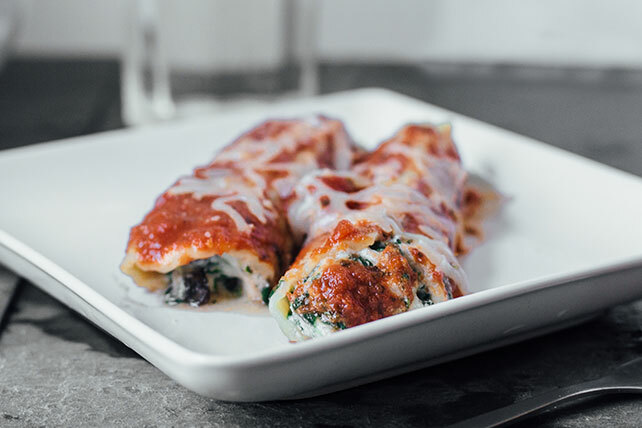 The changes included substituting POLLY-O Natural Part Skim Ricotta Cheese and KRAFT 2% Milk Shredded Reduced Fat Mozzarella Cheese for the full-fat products. In addition, we added spinach and mushrooms to the filling so we could reduce the cheese. Substitute BREAKSTONE'S or KNUDSEN Cottage Cheese for the ricotta cheese and KRAFT 100% Grated Romano Cheese for the Parmesan cheese. Substitute frozen chopped broccoli for the spinach.